As the holiday season was approaching, I pondered new and different cookie recipes to try this year. There are cookies that are good for giving as gifts in person and cookies that can withstand being mailed as gifts. There are also cookies that really only work for serving at home if they’re particularly fragile or require refrigeration. I was looking for options that fit into the first two categories. I also really wanted to spend some more time with a book that I bought a couple of years ago but hadn’t gotten around to mentioning here on the blog. It’s Cookie Love: More Than 60 Recipes and Techniques for Turning the Ordinary into the Extraordinary by Mindy Segal, and it’s full of what I might call special occasion cookies. Although there are some straightforward recipes in the book, several of the cookies require a multi-step process. 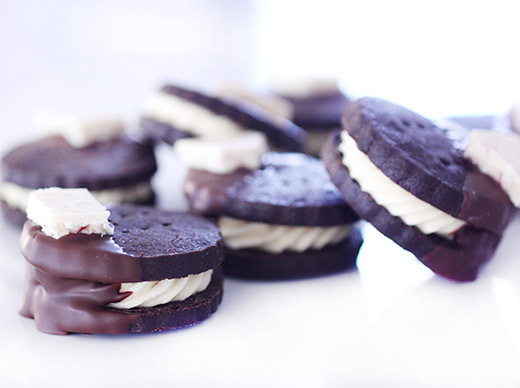 That was the case with these sandwich cookies, but I can tell you that all the steps involved were worth it. Segal named this recipe The Black Sabbath after the band’s early music because of the intense, dark chocolate flavor of the cookies. As written, the filling is made with cream cheese and flavored with crushed Starlite Mints. Because I wanted to end up with a cookie that wouldn’t require refrigeration, I made a buttercream filling instead. And, because neither grocery store where I shop sells Starlite Mints, I added peppermint extract to the buttercream. Then, more chocolate appears for dipping the cookies, and they’re finished with shards of peppermint-white chocolate brittle. 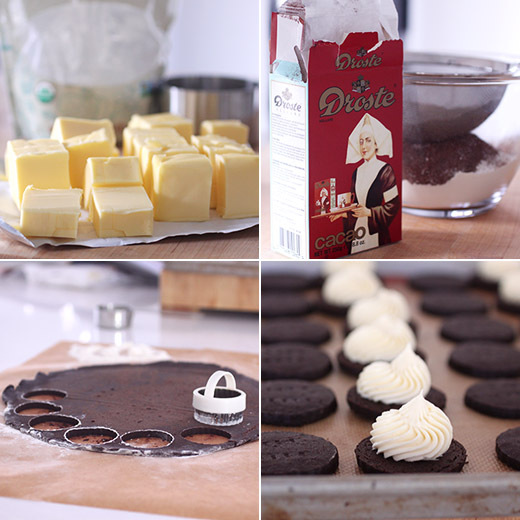 To make the cookies, you want to use a dark cocoa powder. In the past, I’ve used a very dark cocoa from Savory Spice Shop. This time, I found Droste cocoa powder from Holland, and it makes a lovely, dark, black cookie. The dough needs to be divided into two disks and chilled for several hours or overnight after being mixed. It was easy to roll between big pieces of parchment paper. Without the parchment, quite a lot of flour would have been needed for rolling since it is a sticky dough. After rolling to about a quarter inch thickness, the dough in the parchment layers should be placed on a sheet pan and chilled again before cutting the cookies. Each step works best when this dough is a bit cold. The cookies were cut, placed on baking sheets, and docked with a fork before baking. Once cooled, the cookies were matched up for best sandwich fitting. I made a simple buttercream with softened butter, melted white chocolate, confectioners’ sugar, peppermint extract, a little vanilla extract, and a pinch of salt. Each cookie bottom was given a generous swirl of filling. Next, the brittle was made with more melted white chocolate and, since I couldn't find round mints, crushed candy canes. For the brittle, you want some varied texture in the crushed candy. It adds mint flavor, a little color, and some crunch to the brittle. The mixture was spread on a sheet pan and chilled until firm. To finish, dark chocolate and milk chocolate were melted together. 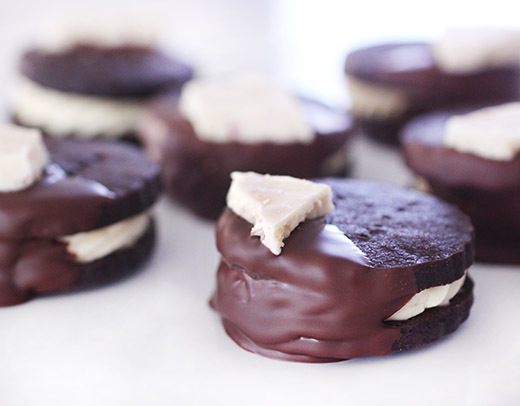 The sandwich cookies were partially dipped into the melted chocolate and topped with broken pieces of the white chocolate brittle. The sweet mint candy and white chocolate balanced the dark chocolatey-ness nicely. This was a really fun cookie to make and to eat, and they hopefully made good cookie gifts. Happy Holidays and happy cookie baking to all of you! You’re going to enjoy this story of Paula Wolfert’s career in food. She started writing about Moroccan food before several of the key ingredients could even be found in the US. Her focus has always been on authentic international cuisines, and her recipes don’t tend to cut corners. I was intrigued to learn that before she wrote her first cookbook, she was the series editor and organizer of an epicurean subscription program called International Home Dining that was part of Columbia House. She created a different box each month for an international-themed dinner that included recipes and ingredients for a unique meal. During this time, “Paula developed another element of what would become her visionary cookbook-writing style: unapologetically complex recipes, engaging descriptions to capture their flavors in vivid detail, and mail-order sources to bypass the limited American supply chain.” That is my favorite kind of food- and cookbook-writing. Wolfert’s first cookbook was Couscous and Other Good Food from Morocco written in 1973, and her ability to learn the stories behind the food and draw the techniques and recipes from the cooks as she did for this book became her way of researching all of her food topics. She wrote about the cooking of Southwest France before Americans knew much about cassoulet, and then moved on to writing about sumac, pomegranate molasses, and Aleppo, Marash, and Urfa peppers in Eastern Mediterranean. So many ingredients and dishes we take for granted these days were introduced to cooks in the US by Paula Wolfert. She’s now living with a condition of mixed dementia, and this book was written while she could still contribute memories of her life and career. After reading about how she traveled, learned, and cooked her way through so many cultures, I’m looking forward to adding a couple more of her titles that are missing from my cookbook collection. This book moves through Wolfert’s life chapter by chapter, and there are recipes at the end of each. There’s Mussels Saganaki from Thessaloniki, a Mint and Egg Salad suggested as an accompaniment to Turkish kofte, and Tuscan White Beans with Sage and Garlic for clay pot cooking. Some other dishes I want to try are the Leblebi which is a Tunisian soup served over chickpeas and bread cubes with an egg on top and the Sprinkle Pie made with greens and feta with a light cornmeal crust. 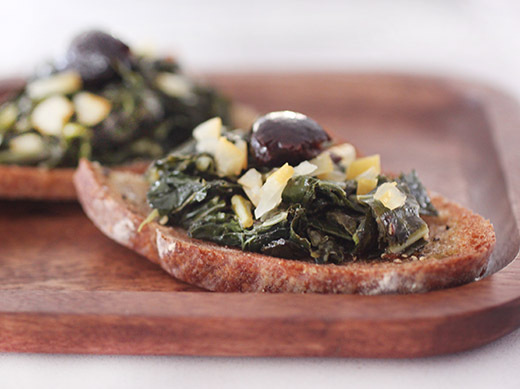 Since this time of year is definitely greens season here, I had to try the Wild Greens Jam recipe. This dish is firmly in the savory category despite jam being in the name. The greens are cooked until very tender and mixed with spices and olive oil to end up in a spreadable or spoonable form. It’s made with a mix of greens, and purslane and mallow are suggested. Sadly, once the other greens appear at our farm stands and farmers’ markets, purslane is gone for the fall. I used a mix of collards, kale, and arugula. 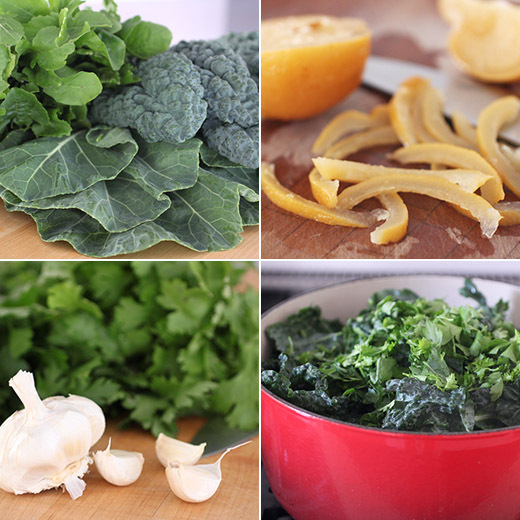 The greens were cleaned, stemmed, and chopped before being steamed. Parsley leaves were added to the greens along with unpeeled garlic cloves, and everything steamed for about 15 minutes. After cooling, the greens were squeezed in a towel and then chopped finely. The garlic was peeled and pureed with cilantro leaves. That mixture was then sauteed in a large skillet with olive oil, and smoked paprika, ground cumin, and cayenne were added. The chopped greens were then added and cooked for another 10 minutes until the liquid evaporated. 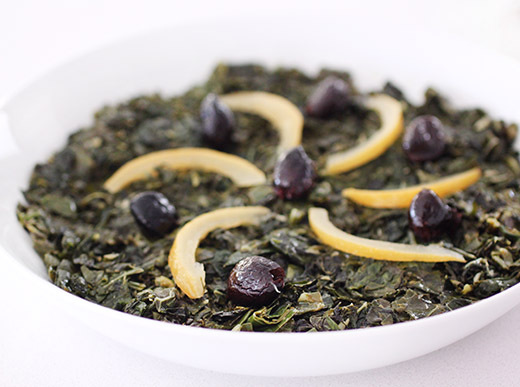 Lemon juice was stirred into the greens with a little additional olive oil, and the mixture was served with preserved lemon and oil-cured olives for garnish.